06.11.2018: Ramp-up of the electromobility site Kamenz is progressing fast. photo caption: Common factory tour in Kamenz with Michael Kretschmer (4th f.l. ), Minister President of Saxony, Roland Dantz (2nd f.l. ), Lord Mayor of Kamenz, Dieter Zetsche (3rd f.r. photo caption: Common factory tour in Kamenz with Michael Kretschmer (4th f.l. ), Minister President of Saxony, Roland Dantz (2nd f.l. ), Lord Mayor of Kamenz, Dieter Zetsche (3rd f.r. ), Chairman of the Board of Management of Daimler AG and Head of Mercedes-Benz Cars, Ola Källenius (3rd f.l. ), Member of the Board of Management of Daimler AG responsible for Group Research and Mercedes-Benz Cars Development, Jörg Burzer (l.), Head of Quality Management at Mercedes-Benz Cars, Frank Deiß (2nd f.r. ), Head of Production Powertrain Mercedes-Benz Cars, Heiko Steinmetz (r.), Managing Director of Accumotive. 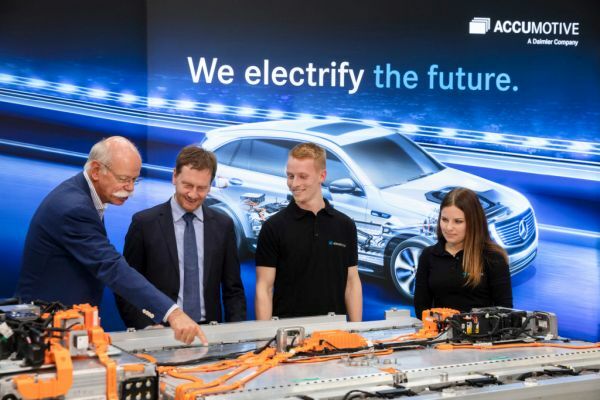 The Daimler AG is putting intensive work in the expansion of the global battery production network and is paving the way for the creation of a cross-divisional electro initiative. The wholly-owned Daimler subsidiary Accumotive at the Kamenz location in Germany will employ around 1.000 people until end of the year 2018. “We are taking big steps in the direction of electromobility. At Accumotive we will double the amount of employees until the end of the year 2018. We will achieve this almost one year earlier than initially planned. 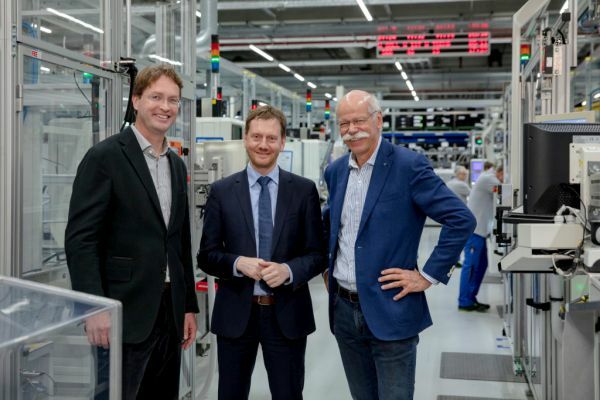 We are thus heading for the start of production of the EQC in spring 2019,” announced Dieter Zetsche, Chairman of the Board of Management of Daimler AG and Head of Mercedes-Benz Cars, during a visit of Michael Kretschmer, Minister President of Saxony, in Kamenz. During a factory tour – at which Roland Dantz, Lord Mayor of Kamenz, Ola Källenius, Member of the Board of Management of Daimler AG responsible for Group Research and Mercedes-Benz Cars Development, Jörg Burzer, Head of Quality Management at Mercedes-Benz Cars, Frank Deiß, Head of Production Powertrain Mercedes-Benz Cars, as well as Heiko Steinmetz, one of the Managing Directors of Accumotive, have participated - the Minister President Kretschmer has gained insight in the electro-strategy of Mercedes-Benz Cars and got an overview concerning the current progress of the site in Kamenz. On this occasion, Prime Minister Kretschmer took the opportunity to test drive the EQC, the new all-electric vehicle from Mercedes-Benz. According to Kretschmer: “What has grown and continues to grow here in Kamenz in recent years is an important investment for Europe, Saxony and Lausitz region. By the end of the year, the number of jobs in the modern plant for lithium-ion batteries is expected to double to over 1,000. In this way, the technology location will continue to develop into a center of electromobility. The German Accumotive GmbH & Co in Kamenz (around 50 kilometers away from Dresden in Germany) was found in 2009 is producing lithium ion-batteries for vehicles of the brands Mercedes-Benz and smart. At present a second battery factory is being built at this site with an investment of 500 Mio. Euros. This will be one of the largest and most modern battery factories worldwide. The investment of Daimler strengthens the region Saxony as important innovation hub of the German automobile industry and offers employees good perspectives in a prospective technology field. Furthermore the subject training and professional development is very important at this site. The Minister President of Saxony has been able to get an impression of this through a talk with two apprentices during his factory tour. In the course of electro initiative, Mercedes-Benz cars will invest ten billion Euros in the expansion of its electric fleet. By 2022, Daimler will electrify the entire portfolio of Mercedes-Benz, offering customers at least one electrified alternative in all segments. The company is planning to offer more than 130 electrified vehicle variants. Thereof more than ten will be fully electric passenger cars - throughout all segments, from the smart to the large SUV. The first Mercedes-Benz of the new product- and technology brand EQ will be the EQC, which will be ramped-up in spring 2019 in the Mercedes-Benz Bremen plant and then will reach the market in mid-2019. The second battery factory in Kamenz has been designed as a CO2-neutral factory: Daimler thinks in the sense of electromobility holistically and builds the production on sustainability. A power station and a photovoltaic system will – in connection with fixed battery storage – provide the production facility with energy. The new battery factory sets standards with modern systems and technology measures in the domain Industry 4.0. The start of the pre-series production has started in mid-2018 and in spring 2019 the volume production of the EQC battery will follow. The construction of the second factory on a 20 hectare (2,152,782 square feet) large site, quadruples the production and logistic area in Kamenz to a total of around 80.000 m2 (861,112 square feet). “The location Kamenz belongs to the pioneers in the electromobility worldwide and in Germany. For our employees the expansion of this site is a confirmation of their performance and their know-how. Since 2012 until today Kamenz has produced more than 200.000 batteries on the basis of the lithium ion technology,” says Steinmetz. 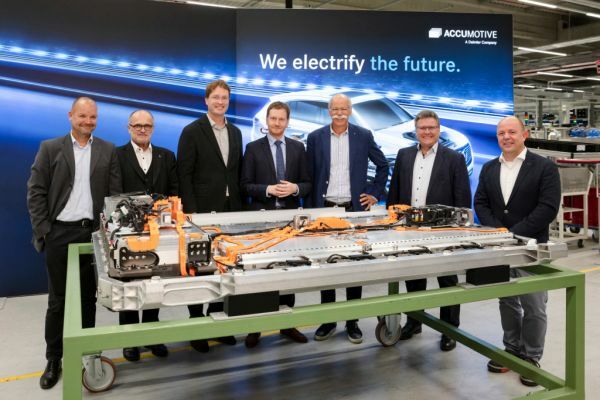 Accumotive is producing drive batteries for electro- and plug-in hybrid vehicles and also batteries for the stationary Mercedes-Benz energy storage as well as for the 48-volt-system. The trendsetting 48-volt-board-network celebrated its premiere in the new generation of the S-Class and will be implemented gradually in different models with new Mercedes-Benz engine technology.